Even sneak-thieves need to consider personal protection sometimes. And for the warrior looking to preserve their agility, nothing will suit quite as well as our Dark Rogue Leather Armour, which offers killer style as well as a high degree of protection. Crafted with protection in mind, this armour is double-layered and features stylized plating along the core, which not only offers enhanced protection but also serves to create an impressive look when the armour is viewed in the light. It is crafted entirely in 7/8 oz. chrome oil tanned leather, which ensures that the armour is surprisingly supple and soft to the touch, while still being quite hardy and durable. As such, it makes for fantastic costume armour, as well as superb protection to wear when you are preparing to head out to your local LARP chapter. The armour is a two-piece design, featuring a broad belt that covers the abdomen as well as a matching chest protector that covers the chest and shoulders. A hood is attached to the top, befitting those who prefer to keep their identities hidden and secret, while it also features a pair of sword frogs attached to the back, for those who want to keep their weapons handy and available. Both pieces of the armor are belted around the sides and the back, providing for an adjustable fit that can easily be adjusted to fit between a 31 inch chest and a 46 inch chest. This armor is hand crafted right here in the USA and is an item exclusive to our shop. Its rugged, its appealing, and best of all, it is extremely comfortable. 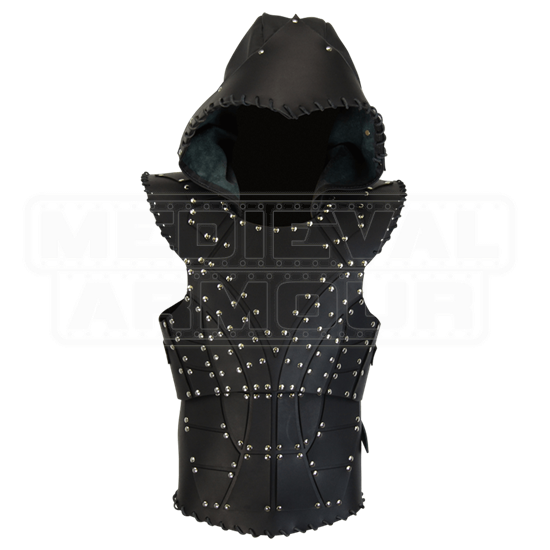 All three of those qualities make this Dark Rogue Leather Armour THE armour of choice when it comes to creating the perfect, battle-ready look for any sort of assassin, sneak-thief, rogue, duelist or adventurer who might prefer to stay mobile and light. Sized to Fit Between a 31 Inch Chest and a 46 Inch Chest. 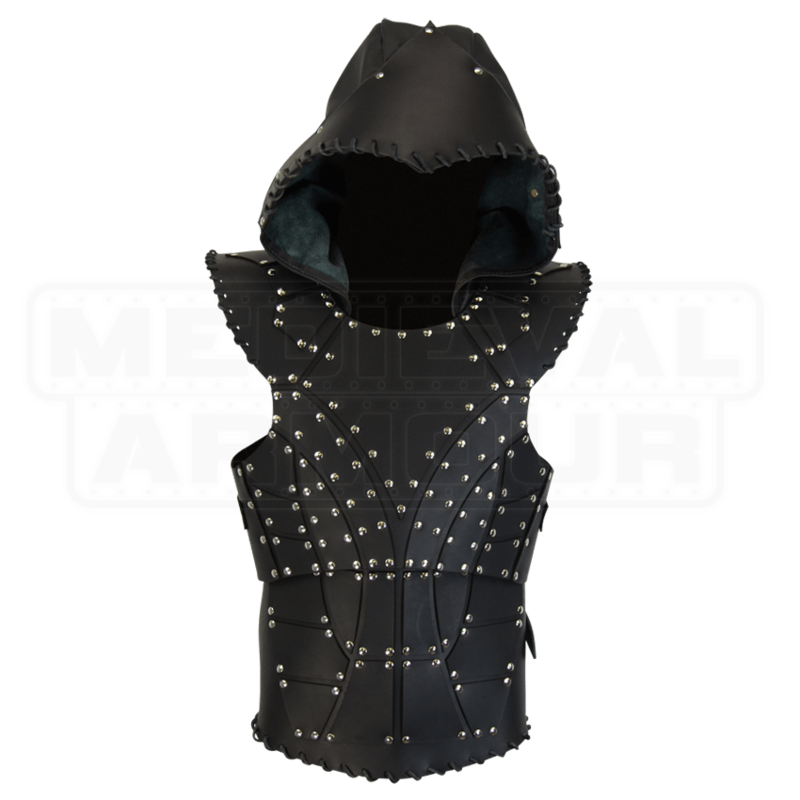 Adjustable, via Straps and Buckles that fasten the armour around the sides and the back. 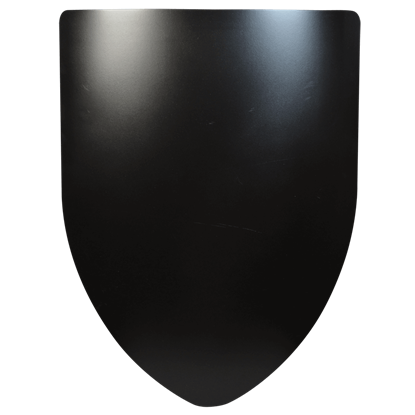 The Plain Steel Battle Shield comes in a wall display version with a chain from which to hang it or a hand held, battle-ready version with heavy duty, 1.5-inch leather straps on the back. Order the version that suits your needs.